History is made in the present. It is not some authentic truth but something vulnerable to entropy. Filtered, edited, glorified, and simplified, past events are made present through narrative, functioning as allegory for current events. History is and only can be artificial. It’s curious, then, that historical accounts are so often accepted as fact. We trust that history is objectively connected to an event which, by its temporal nature, is only as real as it happens. Art, meanwhile, is often perceived to be subjective although, as John Dewey argued in Art as Experience, as an artifact, as a made entity, there is an inherent “realness” in the artwork’s very existence. Its having been created is fact enough. 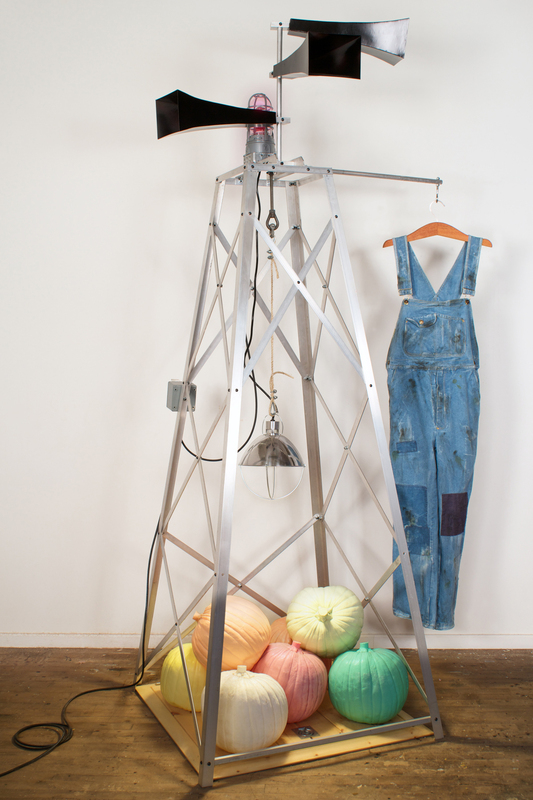 This is evident in the pair of overalls found hanging from a clothes hanger in Untitled (Bachelor Farmer Signal Tower), fabricated completely by the artist. At a comfortable distance, they read as a found object – it is easy to conceive of a similar article already existing in the real world. But upon close inspection, slight irregularities in the stitching and the lack of commercial label indicate that they have instead not only been made, but distressed and repaired by Colburn to suit his vision. This seems almost like an act of trickery – the real thing has been substituted for a prop in an act that collapses years of wear and abuse into a number of days in the artist studio. They are, in effect, a representation of a functional article, a reminder of a real thing. The overalls in Untitled are one among a spectrum of indistinct temporal references in the piece and the exhibition as a whole. They are suggestive of a long history (whether the imagined wear by a farmer or the actual creation by the artist) and represent a romanticized agrarian lifestyle that everyday becomes something more of the past. These references to the old are united in conversation with elements of tangible newness: pre-fabricated electrical components, an un-weathered pine trap door, the aluminum structure off which the overalls hang. And then there are the pastel cast-plastic pumpkins at the base of the structure, which shake us out of what could have been an otherwise believable narrative. They are fictional artifacts whose existence is unique to this artwork and therefore indifferent to time. In conflating the old, new, and the timeless, the work is imbued with a sense of “madeness” that is also expressed through the many process-oriented construction techniques employed such as sewing and casting. It is the artifice of the work as a whole that makes it objectively real, though fantastical, slightly absurd, and open to multiple readings. As sculpture it is free from the burden of accuracy and the limits of chronology. There is likewise no mistaking the artifice in Centennial (American Still Life), a mediated tableau from which the viewer is twice removed. The scene presented is suggestive of what one might encounter backstage at a reenactment. We are put in the position of voyeurs, behind the scenes and therefore displaced from the action. At the same time, we are well aware of the fact that we are looking at a rendering and not, in other words, an actual event. 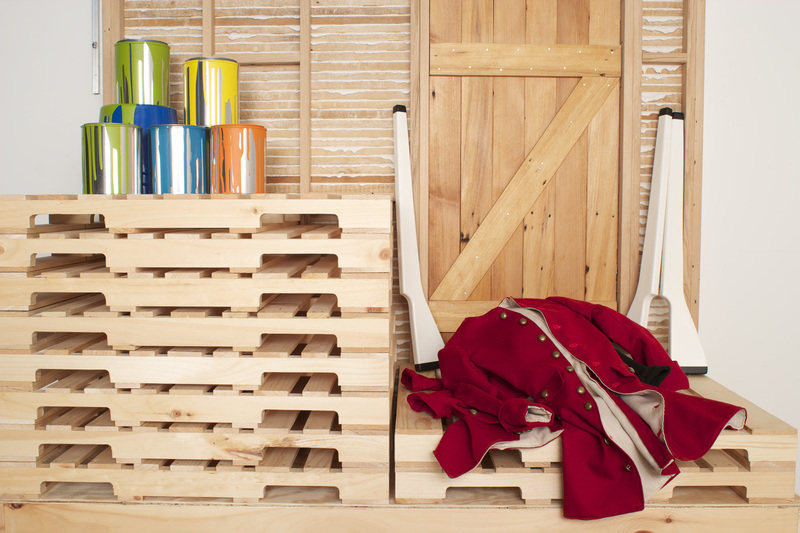 This second layer of displacement operates through a distortion of scale – the period costume, the palettes, the wood lath – all carefully crafted at half-size. This sets up an interesting dichotomy. On the one hand, the piece reads as might a museum diorama or a salesman sample, as a representation connected to a supposed real-world original. Yet on the other hand, its smallness removes it from realness. Rather than creating an illusion of a scene having been plucked from reality and placed in a new viewing context, its unfamiliar scale makes us immediately aware that we are being confronted with something fictional. Instead of negotiating the sculpture in the physical space as we engage the objects of our physical reality, we negotiate the work visually and intellectually. As a representation of a representation, Centennial challenges us to reconcile what is depicted with the question of why it is depicted in this mediated fashion. In the same way that a third-person narrative makes the reader an observer rather than a direct participant, the presentation strategies that Colburn utilizes also shift the performative focus of the work from the audience to himself as the artist. This combined with the visible degree to which the elements of the composition have been crafted helps to build an understanding of the maker as an active agent in the work, much in the way a historian is an active agent in constructing history and a re-enactor is in representing it. We find ourselves behind-the-scenes again with The Loft (A Year’s Unfinished Thoughts), only this time in the studio as the curtain is pulled back on the artist’s creative process. Here, narrative takes form as an archive of recent personal history, one year of unfinished ideas-made-artifacts through the vehicle of display. Revealed to us are connections to and between the other two works in the exhibition. An ill-formed mass of mis-cast plastic links to the materiality of the pumpkins in Untitled, while cast aluminum gourds likewise fit into the agrarian theme; a diminutive door and drum, both displayed mid-process, share the same half-scale with Centennial. Also presented are more curious objects – tiny polystyrene bricks, a moon maquette – objects that less readily associate with the other sculptures in the exhibition but that do tie into to Colburn’s broader body of work, reminding us again that he is indeed the authority behind it all. 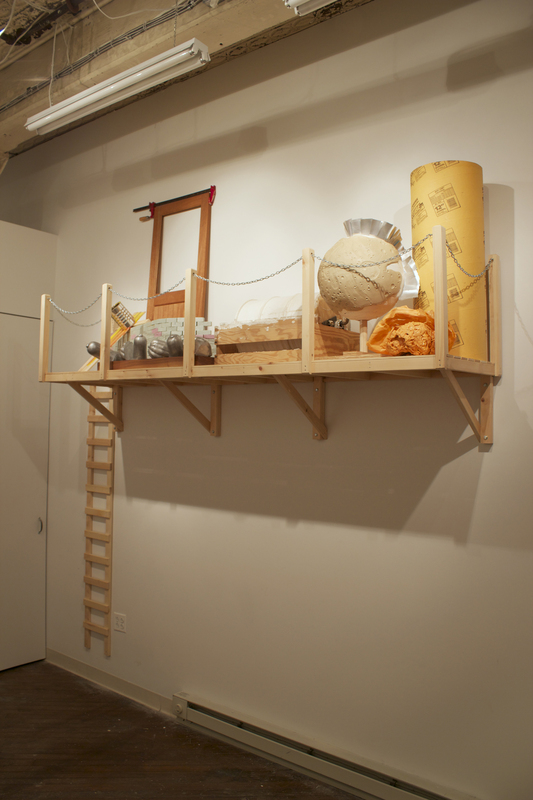 The Loft not only unifies the three works, but does quite literally what Untitled and Centennial do by suggestion in exposing the act of making. Curiously, the very real objects that are presented to us are done so on a small-scale stage (again, half-size) that rather seems to emphasize the fact that these are “objects being presented.” In an overt way, this is a document, a representation, even a recreation, of art-making-as-performance. The limits of temporality have long posed a challenge to the performer. As Peggy Phelan expressed, when the performance is the consummate experience, then documentation of the event is surely something else. This is the challenge with which history is constantly at odds. In other narrative forms, including the sculptural work of Colburn, this burden is lifted because, as creative works, we understand them as “made” entities. In fact, in the case of The Loft, to reveal the shortcomings of representation is precisely the point. The physical form only serves to remind us of an experience, which is generally that of another individual, and almost always of another space and time. This is a theme recurrent throughout the exhibition as we find ourselves imagining the characters (including the artist himself) within these implied narratives. In The Noble Amateur, Colburn offers a textured, tactile, and conceptually rich experience that is ultimately indebted to the breadth of his technical ability. In fact, it is the suggestion of breadth that ties the title of the exhibition to the works themselves. The title is, appropriately, a historical reference that functions as a metaphor for Colburn’s creative practice. In the 18th an 19th centuries, scientific inquiry was conducted most often by upper-class individuals who, though lacking formal expertise, had enough education to make considerable contributions in a variety of intellectual areas. These “noble amateurs” were not committed to a single discipline but were led to various fields by the potential of new discovery. This is an apt comparison for Colburn, who seeks out appropriate creative solutions rather than confining himself to the conventions of established artistic disciplines. The breadth of his skill is immediately recognizable in his work. It is only through close inspection that subtle imperfections are revealed, giving his work an essential, human, quality. In an era of art in which appropriation is a dominant means of “creation,” and democratized media forms have shifted our understanding of authority, Colburn’s work makes a strong argument for the authenticity of artifice. Darcy Van Buskirk is an artist and writer. She received her MFA in Sculpture from Syracuse University in 2011 and currently lives and works in Philadelphia. She has contributed recently to Title magazine; her artwork can be viewed online at darcyvanbuskirk.com. Dewey, John. Art as Experience. New York: Penguin Group, 2005. 85-89. Print. Peggy Phelan quoted in Lütticken, Sven. “An Arena in Which to Reenact.” Life, Once More: Forms of Reenactment in Contemporary Art. Ed. Sven Lütticken. Amsterdam: Idea Books, 2005. 23. Print. To download a .pdf version of this essay click Colburn_VanBuskirk_October_2013.